We are heading to Rehoboth Beach, Delaware on Saturday for a week away. You can bet there will be plenty of time spent relaxing and reading. 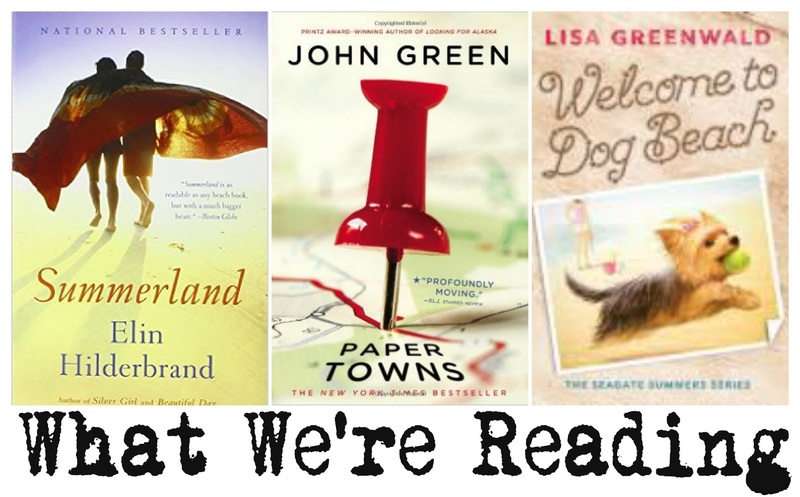 Here's what we'll be reading while we kick back on the beach. A fatal car crash on Nantucket changes the lives of four teens. Questions linger about exactly what happened to cause the crash that kills one and leaves another in a coma. Long-held secrets about the teens and their parents are revealed and rock this small community to the core. But surprisingly out of overwhelming sorrow new love takes flight. Brilliant wit and brutal honesty, Green's trademarks, are ever prevalent in this young adult novel about unrequited love. In the middle of the night Margo and Quentin plot revenge. Quentin has loved Margo from afar for for too long and now she seems within reach. Until dawn breaks and Margo has vanished. Remy's family returns to Seagate summer after summer, but this summer Remy is returning without her beloved dog Danish who passed away. Summer on Seagate is just not the same without Danish. Remy vows to reclaim the bliss of summer's past by hatching a plan to bring the magic back on Dog Beach. Note: This is book #1 in a series. What are you reading? Leave a comment to let me know!